Apparently, the massive cost of policing this bunch of third-rate, z list reprobates is to be shouldered by the taxpayer (broad shoulders, you’ll remember). It’s only in Scotland that the UK government won’t pick up the tab for these jamborees. Fluffy got a record-breaking crowd. And little wonder. Can you imagine how riveting it must be to sit through a Muddle speech? Preparation is everything. Mind you don’t cut your thumb, Govey. Just in case that didn’t go in the first time. These are the people that shed a crocodile tear for the residents of Grenfel Tower. Ah yes, what kind, indeed? A Tory leadership hopeful. Where there is money to be made, the conscience and religious sensibilities of the Rees-Moggs of this world go flying out the window. In her manifesto, Theresa May announced plans to replace free universal lunchtime meals for infants in England with free breakfasts for every pupil up to the age of 11. But when calculations were done it was discovered that the money they had set aside for this meant that just under 7p spent would be available to spend on each breakfast. At this point, it is worth remembering that when Iain Duncan Smith was a government minister he spent £39 on a breakfast for himself. 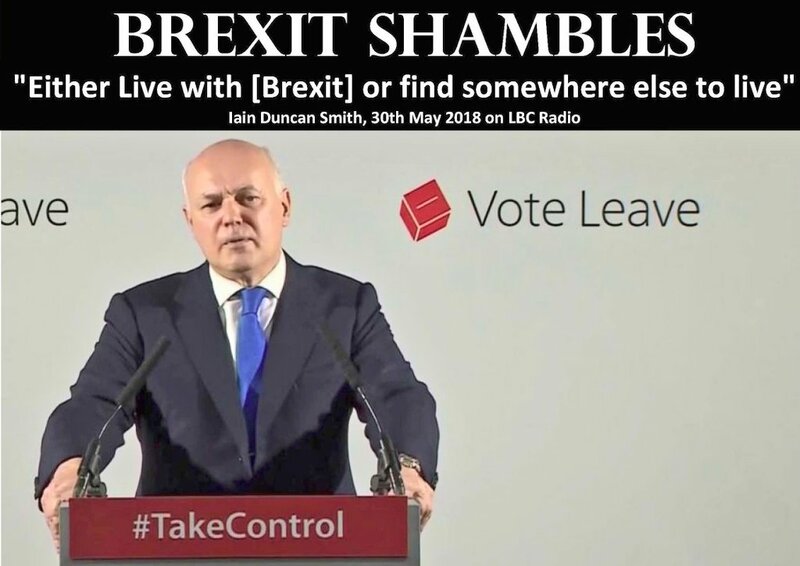 Of course, we at Munguin’s Republic realise that Mr Duncan Smith is far larger than the average under-11-year-old, and surely needs considerably more food to keep him going, but seriously …557 times larger?? Surely that would make him a giant of a man… No surely, surely not. So, hoping no one would notice, the Theresa May Strong and Stable Party have quietly said that they will have to look again at the figure. Damned right they will! This time with a calculator in their hands. And these are the people that we didn’t vote for, who will be negotiating the biggest change in the UK in 45 years? Jings, crivvens, help ma boab. Heaven help us. I heard on the news this afternoon that Amber Rudd (she’s the Home Secretary in the Theresa May Strong and Stable government, in case you didn’t know) has warned the United States of America NOT to leak more information about the Manchester terrorist. They had apparently released his name to the press without permission from the Brits and Rudd had wanted to “keep the element of surprise”. She told BBC Radio 4’s Today programme she had been very clear with Washington “that it should not happen again”. The US authorities must have been quaking with fear after being thus warned by as august a figure as whatever her name is, I forget. So much so that they pretty much immediately leaked some more information. Oh, for that special relationship, eh? Author trispwPosted on January 25, 2017 January 25, 2017 Tags Boris Johnson, Brexit, Donald Trump, Iain Duncan Smith, John Major, Michael Gove, NHS30 Comments on WHO EVER THOUGHT MUNGUIN WOULD REPOST JOHN MAJOR?